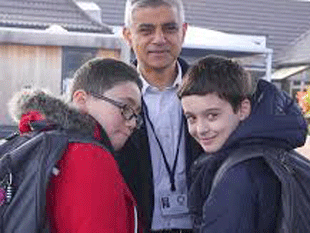 In a new scheme launched by the Mayor of London, primary school pupils will carry special backpacks with state-of-the-art air quality sensors on their journey to and from school to help monitor the levels of toxic air young Londoners are exposed to. 250 pupils from five London primary schools in Southwark, Richmond, Greenwich, Haringey and Hammersmith and Fulham will take part in the project, wearing specially adapted backpacks to and from school for a week. Weighing just over 1kg, the sensors fit into lightweight bags and measure particulate matter (PM2.5 and PM10) and nitrogen dioxide (NO2) levels. The children will use the backpacks like a normal bag (the monitor takes up one pocket, leaving plenty of room for school equipment), allowing the monitors to record pollutant levels on each child’s journey to school and throughout the school day. The data from this study will allow King’s scientists to analyse at which point of their journey to school (or which part of their school day) children are exposed to the most pollution. They will also be able to compare the exposure of children who have similar journeys but take different routes and travel modes and then make recommendations of how children can reduce their exposure in future. The project itself was devised by City Hall and C40 Cities – the leading global alliance of cities committed to addressing climate change. Once this approach and technology has been proven in London, the goal is to see it introduced in cities around the world. London is a lead city, alongside Bengalaru, of the C40 Air Quality Network announced during the Mayor’s visit to India in December 2017. The Mayor of London, Sadiq Khan said: “It remains a shameful fact that London's toxic air is harming the lung growth and health of our young children, and we are determined to do everything in our power to protect them. “This is another excellent initiative by the Mayor of London. By monitoring the air that children breathe on the journey to and from school, we will gain a better understanding of which pollutants are the most harmful and where they are coming from, helping us to support effective improvements in public health.